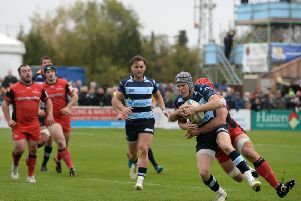 Bedford Blues return to winning ways after defeating Nottingham 28-19 at Goldington Road on Saturday afternoon. Tries from Pat Tapley, Sam Blanchet and Jordan Burns secured the home victory for the Blues who haven’t been victorious in their last two matches on the road. Bedford kicked from left to right in the opening 40 minutes and they put on an incredible defensive display stopping every Nottingham attack in the early waves leaving the visitors frustrated. Former Blues player Viliami Hakalo opened the scoring for the green and whites with a controversial try that the Blues players were adamant that another Nottingham player blocked up the play allowing the Tongan international the space to run the ball over the line before Dan Mugford kicked the extras. Bedford didn’t dwell on going behind for too long as they were awarded a penalty in the 11th minute which Jake Sharp sent over the posts. The Blues hit back again just two minutes after when Pat Tapley and Jake Sharp linked up well just inside Nottingham’s 22 before Sharp was tackled by Mugford but Tapley swooped in and collected the ball before showing a clean pair of heels and crossing the line before Jake Sharp added the extras. A few minutes after Sharp added another penalty which extended Bedford’s lead to 13-7. Bedford were enjoying a lot of pressure just inside Nottingham’s 22 before Sam Blanchet was shown yellow by referee Greg Gardner for deliberately slapping the ball away during a tackle which allowed Nottingham to kick the ball in the corner of the 5 metre line but their attack broke down and Bedford were allowed to clear their lines. Bedford continued their solid defensive performance but it didn’t take long for Nottingham to use the extra man to their advantage during a driving maul which sent Paul Grant over the line but Mugford failed to add the extra points after sending his kick wide of the posts. It was an end to end game and it didn’t take long for Bedford to get back on the attack but the Blues attack was ended after the ball was deliberately slapped out of Pat Tapley’s hand but the referee kept the card in his pocket and just awarded a straight penalty which Sharp converted to add the extra three points. Mugford was handed his own opportunity to kick for three points to narrow the deficit but his kick glided wide of the posts again and Bedford went in to the break leading 16-12. Bedford came out in the second half on the back foot with Nottingham enjoying the best part of possession but their defensive line was still as stubborn as it was in the first 40 minutes holding Nottingham at arm’s length. With the contest being so hardly fought the referee blew up for timeout allowing several players the time to seek attention from the physios but there was no major injury worries for either team. Nottingham carried on enjoying most of the possession but they still failed to break down Bedford’s solid wall like defence with great solo defensive efforts coming from Haydn Thomson-Stringer and Nick Fenton-Wells who both put their bodies on the line on many occasions to defend Bedford’s lead. Both teams were end to end but neither could break down their oppositions defence to add to their points on the board but it was Bedford who managed to break down the green and whites defence first. A turnover in the ruck for Bedford allowed Mike Howard to steal the ball and set up an attacking opportunity for the Blues when he offloaded the ball to Pat Tapley who charged down the line before sending the ball out wide to Sam Blanchet who zig zagged his way through the final defenders before charging across the line but Sharp failed to convert the extra points. Nottingham didn’t let their heads drop as they too were allowed to work their way through the attacking waves before sending Darryl Veenadal charging down the line and grounding the ball before he failed to convert the extras after Mugford was side-lined due to picking up a knock just a few minutes before. Nottingham carried on applying the pressure on Bedford’s defence but the Blues stood firm and didn’t allow any bodies through but Nottingham did manage to pick up a penalty which they chose to kick for touch instead of kicking for the three points. It wasn’t a wise decision as the penalty came of nothing after Jake Sharp cleared the Blues defensive lines once again.